La Conquista is one of those places just off the freeway where travelers pop in for a fast meal, then slide back onto I-5, never to return. Femme de Joie and Amico del Signore visited a couple of months after it opened. It was, not to put too fine a point on it, Godawful. 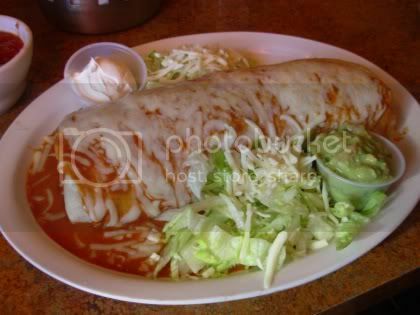 All M. de Joie recalls of that evening is a vegetarian burrito filled with what were labeled "grilled vegetables." They weren't grilled, they were interrogated and tortured. Amnesty International and the Geneva Convention couldn't have saved them. We expected La Conquista to go out of business shortly. Three years later and La Conquista is still in operation. Femme de Joie decided to be brave and give it another try. It's hard for her to believe that a restaurant could stay in business based on shots of 500 tequilas, but that may indeed be the case, as the food ranges from pretty average to pretty stuccolike. Service was friendly and fast. Chips and salsa arrived at the table promptly, along with one food menu, one tequila menu, and one cocktail menu. This, in addition to the laminated tequila menu tacked on the wall of every booth, did not bode well for what the food might be like. The menus are difficult to read, with bolded font on very intensely-colored paper in torn plastic page protectors. 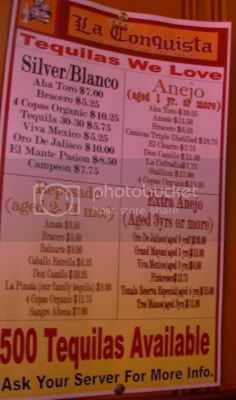 And they're badly organized: La Conquista has all the standard Mexican menu items, but you'll have to search for them. They're there somewhere in the midst of more tequila promotion. 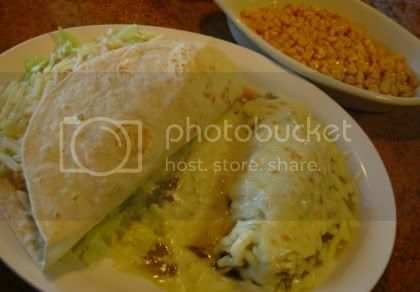 Combination platters are featured at La Conquista, most of them running $9.29 at lunch and $9.99 at dinner; they come with a choice of sides -- refried beans, corn, rice, or a green salad. Shredded beef filling was moist and tender but not especially flavorful. The refried beans inside were not nearly as hot as the meat so there were hot and cool spots within the burrito. Serving size was very generous. This combo of enchilada and taco were amply sized, filled with tender but bland shredded meat, but overwhelmed with too much melted cheese. It took a few spoonfuls of salsa to add any character other than cheese. A side salad was served separately (a good idea instead of lettuce wilting rapidly on a hot platter); nothing out of the ordinary but was adequate. The corn also was served separately -- plain buttered corn but unusually sweet, as though it had been heated in sugar water. Shredded beef tamale and chile rellano, rice and beans ($9.29 lunch, $9.99 dinner). This plate was heavy going and difficult to plow through. The tamale was shaped like a taco with nary a corn husk in sight, plasterlike masa reminiscent of canned Gebhardt's tamales and the same shredded beef used in the wet burrito. Gobs of melted Monterey Jack cheese engulfed the beef bursting from the masa casing. 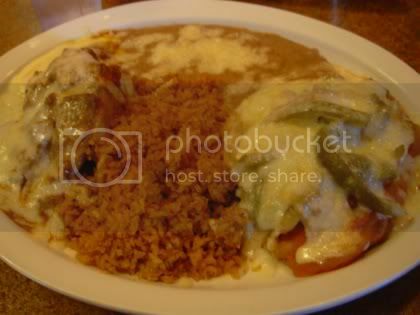 The chile rellano was a canned green chile filled with Monterey Jack cheese, coated in a heavy floury egg batter and deep-fried, then covered with more cheese. Refried beans were canned and the rice had a weird and unpleasant over-reheated taste. Everything was very salty. Though M. de Joie visited La Conquista three times during prime dining hours, she never saw more than ten tables occupied. She has to assume those 500 tequilas are keeping it in business - though she didn't actually see anyone belly up to the bar and order a shot. If you're looking for a tequila sunrise, an aged anejo, or a shot with a lick of salt and a squeeze of lime, this is the place, but M. de Joie thinks you could do better elsewhere for dinner. Note: Since this was published in A News Cafe, La Conquista has closed and is currently due to be replaced (as of August 2012) by Mazatlan Grill. La Conquista, 1630 Hilltop Drive, Redding, CA 96002. 530-222-0450. Open Tuesday-Saturday, 11 AM - 9 PM, Sunday 11 AM - 8 PM. No checks. Cash, cards. Full bar. Vegetarian selections. Parking on-site. Outdoor seating.